While it's the most colourful festival of all, Holi also comes with its baggage - sticking out at work due to your stained skin days after everyone is back to looking their normal selves, getting bombarded by balloons before a meeting or a gujiya overdose. This is still the non-scary aspect of things thanks to the harmful chemicals used in coloured gulaal available in the market. 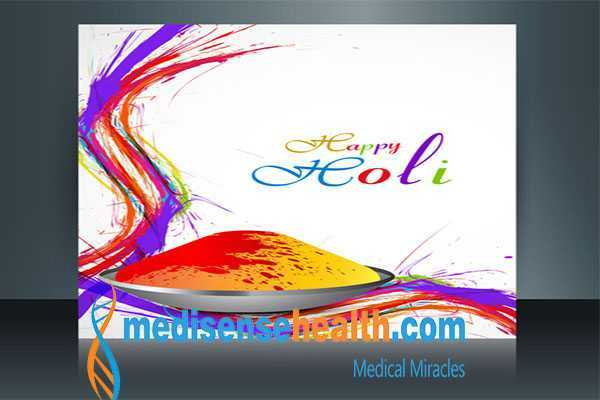 Dr Sumit Gupta, consultant dermatologist, Skinnovation Clinics, Delhi, says, "Holi colours contain harsh and corrosive chemicals like lead oxide (black colour), chromium iodine (purple colour), aluminium bromide (silver colour), mercury sulphite (red colour) and copper sulphate (green colour)." Apart from these, some products may also be treated with glass powder, asbestos, diesel, to give it a glossy, shiny texture. All these harm the skin and eyes, along with internal organ systems. Dr Bhavuk Mittal, consultant and director, dermatology, kin Hair and Laser Clinic, Ghaziabad, says, "Side-effects include itching, dryness, exfoliation of skin, erosions of skin and eczema, and skin abrasions. The gulaal could be adulterated with dangerous dyes meant for clothes." So, go organic or make your own colours using turmeric and gram flour for yellow colour, beetroot and pomegranate for pink colour and mehendi for orange colour. Dr Walia Murshida Huda, senior medical officer, Healthians, says, "Natural colours will protect your skin, hair and eyes. Make sure you use clean water and add neem water to it. Better still, boil marigold flowers for coloured water." Or get a taste of Spain's tomato festival by using tomato juice for red colour! Avoid applying gulaal near your eyes, mouth and nose. Don't rub colour onto the skin vigorously as it can give you a rash. People who have excessively dry skin or underlying eczemas should avoid playing with colours. Avoid throwing gulaal in the air, irrespective of how awesome it might have looked on TV. This only causes unwanted inhalation and exposure of eyes to suspended particulate matter. Uncovered food should not be kept in the vicinity. Wear loose-fitting, comfortable, cotton under and over-clothes. Make sure that your groin, armpits, etc, don't stay drenched for long. Dr Syed Nazim Hussain, consultant, Dermatology, Columbia Asia Hospital, Gurugram, recommends getting a thorough massage with coconut or olive oil, which will prevent damage not only from the harsh colours, which seem in easily if you have dry skin, but heat and dirt as well, an hour before your play. "The oil acts as a protective layer and makes it easier for the colour to come off later. Don't miss out on places like behind your ear, between fingers," he says. Dr Vijay Singhal, senior consultant, dermatology, Sri Balaji Action Medical Institute, New Delhi, recommends using waterproof sunscreen lotion of SPF 30 or more and to paint your nails with a dark shade. If you're in the sun for more than three hours, remember to reapply it. Don't use using harsh soaps and shampoo to get rid of the colour, and instead opt for a mild soap. But, never wash your face with soap first because it's alkaline in nature and may cause further dryness. Use a cleansing cream or lotion instead. Avoid using kerosene, petrol and spirits to remove stains, as they will further dry the skin. It's also crucial to stay hydrated by drinking water before, after and during the festivities. Water keeps the harmful chemicals from being absorbed into the skin, besides helping get rid of excess toxins. Dr HK Kar, HOD, Dermatology, Paras Hospitals, Gurugram, adds, "Take a shower as soon as you're done playing, without waiting for the colour to dry, which makes it difficult to remove." Dr Vivek Pal Singh, consultant, internal medicine, BLK Super Speciality Hospital, says, "If some part of your body starts itching, wash off the colour immediately and apply a soothing calamine lotion or aloe vera gel and avoid sunlight as it increases irritation." If you've suffered an injury while playing Holi, clean it with an antibacterial lotion to avoid absorption of chemicals, and get a tetanus injection if you haven't taken one in the last four months. If you already have an open wound or cut on your body, put a bandaid on it to avoid entry and absorption of chemicals. Dry hair, which is common in the winter, makes your hair more vulnerable to toxic colour, making it easier for the colours to penetrate deep. A thorough head massage with coconut or olive oil will prevent damage. Dr Vijay recommends, "Cover your hair with a scarf or cap, and tie your hair. People with a sensitive scalp or with dandruff should use a lemon and oil mixture on their hair." Shampoo your hair properly with clean water two-three times at least to remove the colour. You could also go for a hair spa the next day. If you've played only with dry colours, gently brush your hair, which should take out most of the gulaal. Use natural shampoos to wash hair. Avoid hot water to wash hair as it makes your hair dry. As many come in with eye injuries and infections post Holi, doctors recommend washing your eyes immediately if they start burning. Dr Vivek says, "Wear sunglasses while playing. Eyes are extremely sensitive, and the chemical content in the colours can lead to irritation, triggering an allergic reaction." Always wash your eyes with cold water. In case irritation persists for a few hours, contact an eye specialist. Adds Dr Walia, "If your eyesight is weak, use your spectacles and avoid using lens as they can injure the cornea of the eye and cause abrasion." Also, gulaal particles may get entrapped between the lens and the eye, causing prolonged irritation and infection.